Please refer to our stock # 71 when inquiring. "The Coast- Near Exmouth, Devon" Watercolor on Paper: size 11 ¼” x 21”/ Framed 19.1/2” x 29” Tom Rowden was a self taught landscape artist born on 7 February 1842 in Exeter, England. By 1886 he had established himself as an artist with exceptional talent, although he had almost certainly been painting earlier whilst in the Royal Marines. He made numerous painting excursions to Scotland where he perfected his skills at rendering exquisite compositions depicting the highlands. 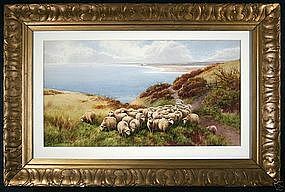 He is best known for depicting moorland animals, particularly cattle, ponies and sheep painted within a Devonshire (often Dartmoor) landscape in all weathers. While living in England he lived in a house called Banavie, at St. Davids Hill, Exeter, where in fact he died on 15 May 1926. He exhibited from 1884, twice at the Royal Hibernian Academy, and an example of his work may be seen in the Exeter Museum. He also exhibited at the Slade gallery in 1883. His pieces have gained great appeal amongst the lovers of the naturalist genre of art as is evidenced by his continuously strong auction records.